Existing dental problems are very diverse and sometimes go to extremes where the only chance of resolution is tooth extraction. These extractions have consequences at both aesthetic and functional levels. Implants, both fixed and removable, emerged to assist in solving aesthetic and functional problems. With a fixed prosthesis you can regain your dental function while maintaining the right aesthetics. Removable implants offer the same advantages plus you can take them out and place them back in at will. When the tooth structure is still usable then the usual choice is a fixed implant. 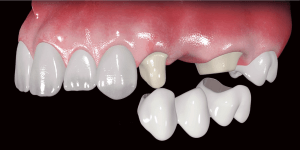 These generally include crowns, bridges and dentures supported by implants. Their placement tends to be simple and you will see a great improvement in dental function. These are usually what most people opt for when given a choice. The denture is the second prosthesis, and its main feature is its ability to be removed and reattached at any time. These prosthesis may be partial or total. You need extra care with dentures as they must be kept in clean places and be properly treated before being reinserted in your oral cavity. However all these precautions will be explained to you by your dentist. After the installation of implants, simple activities like eating are easy because there are no missing teeth that could hinder the action. The aesthetic issue is also guaranteed which will help to restore self-esteem and confidence that can be affected by tooth loss. If you want to have a consultation so that we can discuss the issue of the implants together, contact us.